This article is about the plant genus. For other uses, see Magnolia (disambiguation). Magnolia is a large genus of about 210[notes 1] flowering plant species in the subfamily Magnolioideae of the family Magnoliaceae. It is named after French botanist Pierre Magnol. Magnolia is an ancient genus. Appearing before bees did, the flowers are theorized to have evolved to encourage pollination by beetles. To avoid damage from pollinating beetles, the carpels of Magnolia flowers are extremely tough. Fossilized specimens of M. acuminata have been found dating to 20 million years ago, and of plants identifiably belonging to the Magnoliaceae date to 95 million years ago. Another aspect of Magnolia considered to represent an ancestral state is that the flower bud is enclosed in a bract rather than in sepals; the perianth parts are undifferentiated and called tepals rather than distinct sepals and petals. Magnolia shares the tepal characteristic with several other flowering plants near the base of the flowering plant lineage such as Amborella and Nymphaea (as well as with many more recently derived plants such as Lilium). As with all Magnoliaceae, the perianth is undifferentiated, with 9–15 tepals in 3 or more whorls. The flowers are bisexual with numerous adnate carpels and stamens are arranged in a spiral fashion on the elongated receptacle. The fruit dehisces along the dorsal sutures of the carpels. The pollen is monocolpate, and the embryo development is of the Polygonum type. By the end of the 18th century, botanists and plant hunters exploring Asia began to name and describe the Magnolia species from China and Japan. 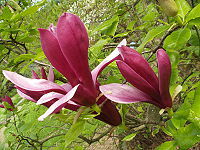 The first Asiatic species to be described by western botanists were Magnolia denudata and Magnolia liliiflora,[notes 4] and Magnolia coco and Magnolia figo. [notes 5] Soon after that, in 1794, Carl Peter Thunberg collected and described Magnolia obovata from Japan and at roughly the same time Magnolia kobus was also first collected. With the number of species increasing, the genus was divided into the two subgenera Magnolia and Yulania. Magnolia contains the American evergreen species M. grandiflora, which is of horticultural importance, especially in the southeastern United States, and M. virginiana, the type species. Yulania contains several deciduous Asiatic species, such as M. denudata and M. kobus, which have become horticulturally important in their own right and as parents in hybrids. Classified in Yulania, is also the American deciduous M. acuminata (cucumber tree), which has recently attained greater status as the parent responsible for the yellow flower colour in many new hybrids. By the end of the 20th century, DNA sequencing had become available as a method of large-scale research on phylogenetic relationships. 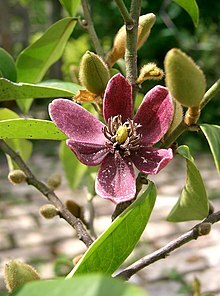 Several studies, including studies on many species in the family Magnoliaceae, were carried out to investigate relationships. What these studies all revealed was that genus Michelia and Magnolia subgenus Yulania were far more closely allied to each other than either one of them was to Magnolia subgenus Magnolia. These phylogenetic studies were supported by morphological data. As nomenclature is supposed to reflect relationships, the situation with the species names in Michelia and Magnolia subgenus Yulania was undesirable. 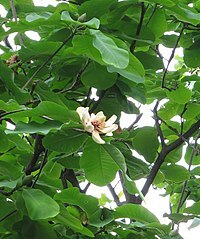 Taxonomically, three choices are available: 1 to join Michelia and Yulania species in a common genus, not being Magnolia (for which the name Michelia has priority), 2 to raise subgenus Yulania to generic rank, leaving Michelia names and subgenus Magnolia names untouched, or 3 to join Michelia with genus Magnolia into genus Magnolia s.l. (a big genus). Magnolia subgenus Magnolia cannot be renamed because it contains M. virginiana, the type species of the genus and of the family. Not many Michelia species have so far become horticulturally or economically important, apart for their wood. Both subgenus Magnolia and subgenus Yulania include species of major horticultural importance, and a change of name would be very undesirable for many people, especially in the horticultural branch. 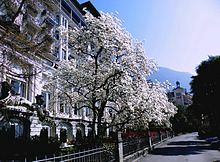 In Europe, Magnolia even is more or less a synonym for Yulania, since most of the cultivated species on this continent have Magnolia (Yulania) denudata as one of their parents. Most taxonomists who acknowledge close relations between Yulania and Michelia therefore support the third option and join Michelia with Magnolia. The same goes, mutatis mutandis, for the (former) genera Talauma and Dugandiodendron, which are then placed in subgenus Magnolia, and genus Manglietia, which could be joined with subgenus Magnolia or may even earn the status of an extra subgenus. 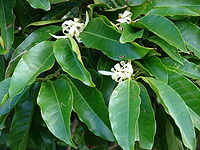 Elmerrillia seems to be closely related to Michelia and Yulania, in which case it will most likely be treated in the same way as Michelia is now. The precise nomenclatural status of small or monospecific genera like Kmeria, Parakmeria, Pachylarnax, Manglietiastrum, Aromadendron, Woonyoungia, Alcimandra, Paramichelia and Tsoongiodendron remains uncertain. Taxonomists who merge Michelia into Magnolia tend to merge these small genera into Magnolia s.l. as well. Botanists do not yet agree on whether to recognize a big Magnolia or the different small genera. 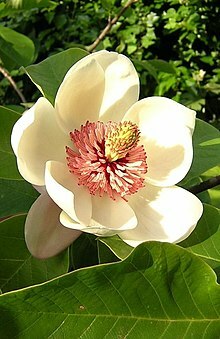 For example, Flora of China offers two choices: a large genus Magnolia which includes about 300 species, everything in the Magnoliaceae except Liriodendron (tulip tree), or 16 different genera, some of them recently split out or re-recognized, each of which contains up to 50 species. 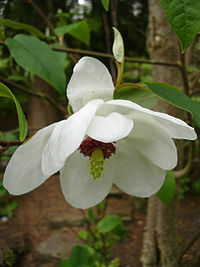 The western co-author favors the big genus Magnolia, whereas the Chinese recognize the different small genera. Anthers open by splitting at the front facing the centre of the flower, deciduous or evergreen, flowers produced after the leaves. Charles Plumier (1646–1704) described a flowering tree from the island of Martinique in his Genera, giving it the name Magnolia, after the French botanist Pierre Magnol. In general, the genus Magnolia has attracted horticultural interest. 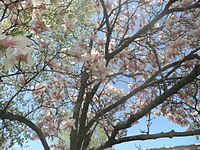 Some, such as the shrub M. stellata (star magnolia) and the tree M. × soulangeana (saucer magnolia) flower quite early in the spring, before the leaves open. Others flower in late spring or early summer, including M. virginiana (sweetbay magnolia) and M. grandiflora (southern magnolia). Hybridisation has been immensely successful in combining the best aspects of different species to give plants which flower at an earlier age than the parent species, as well as having more impressive flowers. One of the most popular garden magnolias, M. × soulangeana, is a hybrid of M. liliiflora and M. denudata. In the eastern United States, five native species are frequently in cultivation: M. acuminata (as a shade tree), M. grandiflora, M. virginiana, M. tripetala, and M. macrophylla. The last two species must be planted where high winds are not a frequent problem because of the size of their leaves. Magnolia tree in the Fall. 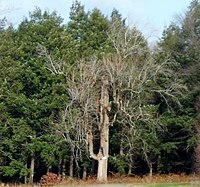 The cucumbertree, M. acuminata, grows to large size and is harvested as a timber tree in northeastern US forests. Its wood is sold as "yellow poplar" along with that of the tuliptree, Liriodendron tulipifera. 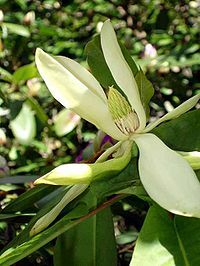 The Fraser magnolia, M. fraseri, also attains enough size sometimes to be harvested, as well. Magnolias are used as food plants by the larvae of some Lepidoptera species, including the giant leopard moth. The aromatic bark contains magnolol, honokiol, 4-O-methylhonokiol, and obovatol. Magnolol and honokiol activate the nuclear receptor peroxisome proliferator-activated receptor gamma. White or Yulan Magnolia (Subgenus Yulania) is the official flower of the Chinese metropolis Shanghai. M. grandiflora is the official state flower of both Mississippi and Louisiana. The flower's abundance in Mississippi is reflected in its nickname of "Magnolia State". The magnolia is also the official state tree of Mississippi. One of the many nicknames for the city of Houston is "Magnolia City". Historically, magnolias have been associated with the Southern United States. Magnolia sieboldii(M. sieboldii) is the national flower of North Korea. Magnolia sieboldii(M. sieboldii) is the official flower of Gangnam. Steel Magnolias is a 1989 American comedy-drama film about the bond among a group of women from Louisiana, who can be as beautiful as magnolias, but are as tough as steel. The magnolia specifically references a magnolia tree about which they are arguing at the beginning. The French song by Salvatore Adamo "Les collines de Rabiah" in the 1970s describes the magnolia trees in Beirut and calls for peace. The Grateful Dead recorded a song titled "Sugar Magnolia" that was first released on the 1970 album American Beauty. The song made its live debut on June 7, 1970, at the Fillmore West in San Francisco. The semiofficial 1972 Dead movie Sunshine Daydream has its title taken from the song's coda section. Tom Petty and the Heartbreakers second studio album You're Gonna Get It! includes a track called "Magnolia", written by Tom Petty. J.J. Cale (December 5, 1938 – July 26, 2013) wrote a song about a woman named Magnolia, which has been covered by Poco, Beck and Lucinda Williams. In 2003, Songs: Ohia released The Magnolia Electric Co. This was the last release under that project's name for Jason Molina before renaming his band Magnolia Electric Co. after the album. "Magnolia" is the fifth track on Australian indie rock group Gang of Youths' debut album, The Positions. In his song titled "Marry Me" Thomas Rhett references the magnolia flower. "The Sweet Magnolia Tree" is the eighth track on Doug Wamble's 2003 CD "Country Libations"
The 1989 movie Steel Magnolias is based on a 1987 play, Steel Magnolias, by Robert Harling. In the 1939 song "Strange Fruit", originally written as a poem by New York schoolteacher and communist activist Abel Meeropol to condemn the practice of lynching, the magnolia flower was referenced as being associated with the Southern United States, where many lynchings took place: "Pastoral scene of the gallant south/The bulging eyes and the twisted mouth/Scent of magnolias, sweet and fresh,/Then the sudden smell of burning flesh." Despite Meeropol's frequent mention of the South and magnolia trees, the image which inspired his poem, Lawrence Beitler's 1930 photograph capturing the lynching of Thomas Shipp and Abram Smith following the robbery and murder of Claude Deteer, actually occurred in Marion, Indiana, where magnolia trees are less common. In the 1960s, magnolias were a symbol of the South in the popular press: the New York Post noted of Lyndon Johnson that "A man who wore a ten-gallon Stetson and spoke with a magnolia accent had little hope of winning the Democratic nomination in 1960," and biographer Robert Caro picks up the symbol by saying that when Johnson became president "[t]he taint of magnolias still remained to be scrubbed off." The Canadian artist, Sarah Maloney, has created a series of sculptures of Magnolia flowers in bronze and steel, entitled First Flowers, in which she draws our attention to the dual symbols of beginnings in the flower, as both an evolutionary archetype and also one of the first trees to flower in spring (see illustration). ^ The number of species in the genus Magnolia depends on the taxonomic view that one takes up. Recent molecular and morphological research shows that former genera Talauma, Dugandiodendron, Manglietia, Michelia, Elmerrillia, Kmeria, Parakmeria, Pachylarnax (and a small number of monospecific genera) all belong within the same genus, Magnolia s.l. (s.l. = sensu lato: 'in a broad sense', as opposed to s.s. = sensu stricto: 'in a narrow sense'). The genus Magnolia s.s. contains about 120 species. See the section Nomenclature and classification in this article. ^ Under the rule of priority, the first name that is validly published in Linnaeus' Species Plantarum (1 May 1753) or any other work of any other botanist after that, takes precedence over later names. Plumier's name was not a binomen and moreover published before Species Plantarum, so it has no status. The first binomen published after 1753 was Lamarck's Annona dodecapetala (1786). Magnolia plumieri (1788) was published on a later date by Schwartz, and is treated as a later synonym, as are Magnolia fatiscens (1817; Richard), Talauma caerulea (Jaume St-Hilaire 1805) and Magnolia linguifolia (1822). ^ Magnolia glauca has the same type specimen as Magnolia virginiana and as the latter is the first valid name, the species is now called Magnolia virginiana (sweetbay magnolia). Var. 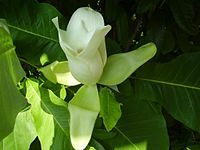 fœtida was renamed Magnolia grandiflora, which is legitimate as the epithet fœtida only has priority in its rank of variety. Magnolia grandiflora is the southern magnolia. Magnolia tripetala (umbrella magnolia) and Magnolia acuminata (cucumber tree) are still recognized as species. ^ Under these names the species were described by Desrousseaux in Lamarck's Encyclopédie Méthodique Botanique, tome troisieme (1792): 675. In the beginning of the 20th century, descriptions which seemed to represent the same species, were found in a work of the French naturalist P.J. Buc'hoz, Plantes nouvellement découvertes (1779), under the names Lassonia heptapeta and Lassonia quinquepeta. In 1934, the English botanist J.E. Dandy argued that these names had priority over the names by which both species had been known for over a century and hence from then on Magnolia denudata had to be named Magnolia heptapeta, Magnolia liliiflora should be changed into Magnolia quinquepeta. After a lengthy debate, specialist taxonomists decided that the Buc'hoz's names were based on chimaeras (pictures constructed of elements of different species), and as Buc'hoz did not cite or preserve herbarium specimens, his names were ruled not to be acceptable. ^ These species were published as Liriodendron coco and Liriodendron figo by J. de Loureiro in Flora Cochinchinensis (1790) and later (1817) transferred to Magnolia by A. P. de Candolle. Magnolia figo was soon after transferred to the genus Michelia. ^ In 1927 J.E. Dandy accepted 10 genera in The genera of Magnoliaceae, Kew Bulletin 1927: 257-264. In 1984 Law Yuh-Wu proposed 15 in A preliminary study on the taxonomy of the family Magnoliaceae, Acta Phytotaxonomica Sinica 22: 89-109; in 2004 even 16, in Magnolias of China. This is not just about grouping some genera together where others do not; authors often choose different boundaries. ^ Often treated as a distinct species, Magnolia pyramidata. ^ Often treated as a distinct species, Magnolia ashei. ^ Often treated as a distinct species, Magnolia dealbata. ^ Bernhardt, P. (2000). "Convergent evolution and adaptive radiation of beetle-pollinated angiosperms" (PDF). Plant Systematics and Evolution. 222 (1–4): 293–320. doi:10.1007/bf00984108. Archived from the original (PDF) on 2015-12-23. ^ Crane, P.R. (1988). "The phylogenetic position and fossil history of the Magnoliaceae". In Hunt, David R. Magnolias and their allies: Proceedings of an International Symposium, Royal Holloway, University of London, Egham, Surrey, U.K., 12-13 April 1996. Milbourne Port. p. 21. ISBN 9780951723487. OCLC 40781614. ^ a b Plumier, C. (1703) Nova plantarum Americanarum genera. Paris. [New genera of American plants]. ^ Dillenius, J.J. (1732), Hortus Elthamensis, seu plantarum rariorum quas in horto suo Elthami in Cantio coluit vir ornamentissimus et praestantissimus Jacobus Sherard. London [The garden of Eltham, or rather about the rare plants that the most distinguished and prominent man Jacob Sherard grows in his garden in Eltham in Kent]. ^ Catesby, M. (1730), The Natural History of Carolina, Florida and the Bahama Islands, containing the figures of birds, beasts, fishes, serpents, insects and plants, Vol. 1. London. ^ Lamarck, J.B.P.A. de (1786), Encyclopédie Méthodique Botanique, tome second: 127. Paris. 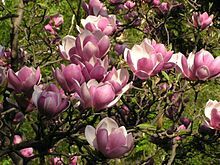 ^ Magnolia kobus only received its name in 1814, when it was validly published by A.P. de Candolle. There has been much confusion about earlier attempts to validly publish this species, especially because descriptions and type specimens did not match. ^ Azuma, H.; Thien, L.B. ; Kawano, S. (1999). "Molecular phylogeny of Magnolia (Magnoliaceae) inferred from cpDNA sequences and evolutionary divergence of the floral scents". Journal of Plant Research. 112 (1107): 291–306. doi:10.1007/pl00013885. ^ Azuma, H.; García-Franco, J.G. ; Rico-Gray, V.; Thien, L.B. (2001). "Molecular phylogeny of the Magnoliaceae: the biogeography of tropical and temperate disjunctions". American Journal of Botany. 88 (12): 2275–2285. doi:10.2307/3558389. JSTOR 3558389. PMID 21669660. ^ Kim, S.; et al. (2001). "Phylogenetic relationships in family Magnoliaceae inferred from ndhF sequences". American Journal of Botany. 88 (4): 717–728. doi:10.2307/2657073. JSTOR 2657073. ^ Figlar, R.B. (2000), Proleptic branch initiation in Michelia and Magnolia subgenus Yulania provides basis for combinations in subfamily Magnolioideae. In: Liu Yu-hu et al., Proceedings of the International Symposium on the Family Magnoliaceae: 14-25, Science Press, Beijing. ^ WCSP. "Magnolia platyphylla in World Checklist of Selected Plant Families". Royal Botanic Gardens, Kew. Published on the Internet. Retrieved 7 August 2015. ^ WCSP. "Magnolia pubescens in World Checklist of Selected Plant Families". Royal Botanic Gardens, Kew. Published on the Internet. Retrieved 7 August 2015. ^ Brambach, F.; Nooteboom, H.P. ; Culmsee, H. (2013). "Magnolia sulawesiana described, and a key to the species of Magnolia (Magnoliaceae) occurring in Sulawesi". Blumea - Biodiversity, Evolution and Biogeography of Plants. 58 (3): 271–276. doi:10.3767/000651913X676817. ^ WCSP. "Magnolia tsiampacca in World Checklist of Selected Plant Families". Royal Botanic Gardens, Kew. Published on the Internet. Retrieved 7 August 2015. ^ WCSP. "Magnolia tsiampacca ssp. mollis in World Checklist of Selected Plant Families". Royal Botanic Gardens, Kew. Published on the Internet. Retrieved 7 August 2015. ^ WCSP. "Magnolia tsiampacca ssp. tsiampacca in World Checklist of Selected Plant Families". Royal Botanic Gardens, Kew. Published on the Internet. Retrieved 7 August 2015. ^ WCSP. "Magnolia tsiampacca ssp. tsiampacca var. glaberrima in World Checklist of Selected Plant Families". Royal Botanic Gardens, Kew. Published on the Internet. Retrieved 7 August 2015. ^ WCSP. "Magnolia vrieseana in World Checklist of Selected Plant Families". Royal Botanic Gardens, Kew. Published on the Internet. Retrieved 7 August 2015. ^ Han H.; Jung J.K.; Han S.B. ; Nam S.Y. ; Oh K.W. ; Hong J.T. (2011). "Anxiolytic-like effects of 4-O-methylhonokiol isolated from magnolia officinalis through enhancement of GABAergic transmission and chloride influx". Journal of Medicinal Food. 14 (7–8): 724–731. doi:10.1089/jmf.2010.1111. PMID 21501091. ^ Kalman D.S. ; Feldman S.; Feldman R.; Schwartz H.I. ; Krieger D.R. ; Garrison R. (2008). "Effect of a proprietary Magnolia and Phellodendron extract on stress levels in healthy women: A pilot, double-blind, placebo-controlled clinical trial". Nutrition Journal. 7 (1): 11. doi:10.1186/1475-2891-7-11. PMC 2359758. PMID 18426577. ^ Ma L.; Chen J.; Wang X.; Liang X.; Luo Y.; Zhu W.; Wang T.; Peng M.; Li S.; Jie S.; Peng A.; Wei Y.; Chen L. (2011). "Structural modification of honokiol, a biphenyl occurring in magnolia officinalis: The evaluation of honokiol analogues as inhibitors of angiogenesis and for their cytotoxicity and structure-activity relationship". Journal of Medicinal Chemistry. 54 (19): 6469–6481. doi:10.1021/jm200830u. PMID 21853991. ^ Fried L.E. ; Arbiser J.L. (2009). "Honokiol, a multifunctional antiangiogenic and antitumor agent". Antioxidants & Redox Signaling. 11 (5): 1139–1148. doi:10.1089/ars.2009.2440. PMC 2842137. PMID 19203212. ^ Hu J.; Chen L.-J. ; Liu L.; Chen X.; Chen P.; Yang G.-L.; Hou W.-L.; Tang M.-H.; Zhang F.; Wang X.-H.; Zhao X.; Wei Y.-Q. (2008). "Liposomal honokiol, a potent anti-angiogenesis agent, in combination with radiotherapy produces a synergistic antitumor efficacy without increasing toxicity". Experimental & Molecular Medicine. 40 (6): 617–628. doi:10.3858/emm.2008.40.6.617. PMC 2679338. PMID 19116447. ^ Lee YJ, Lee YM, Lee CK, Jung JK, Han SB, Hong JT (2011). "Therapeutic applications of compounds in the Magnolia family". Pharmacol. Ther. 130 (2): 157–176. doi:10.1016/j.pharmthera.2011.01.010. PMID 21277893. ^ Fakhrudin, N; Ladurner, A; Atanasov, AG; Heiss, EH; Baumgartner, L; Markt, P; Schuster, D; Ellmerer, EP; Wolber, G; Rollinger, JM; Stuppner, H; Dirsch, VM (Apr 2010). "Computer-aided discovery, validation, and mechanistic characterization of novel neolignan activators of peroxisome proliferator-activated receptor gamma". Mol Pharmacol. 77 (4): 559–66. doi:10.1124/mol.109.062141. PMC 3523390. PMID 20064974. ^ Atanasov AG, Wang JN, Gu SP, Bu J, Kramer MP, Baumgartner L, Fakhrudin N, Ladurner A, Malainer C, Vuorinen A, Noha SM, Schwaiger S, Rollinger JM, Schuster D, Stuppner H, Dirsch VM, Heiss EH (October 2013). "Honokiol: A non-adipogenic PPARγ agonist from nature". Biochimica et Biophysica Acta (BBA) - General Subjects. 1830 (10): 4813–9. doi:10.1016/j.bbagen.2013.06.021. PMC 3790966. PMID 23811337. ^ Scanlon, J (2007). "If My Husband Calls I'm Not Here: The Beauty Parlor as Real and Representational Female Space". Feminist Studies. 33: 2. ^ Robert A. Caro, The Passage of Power, vol. 4 of The Years of Lyndon Johnson (New York: Alfred A. Knopf, 2012), p. 348. Johnstone, G.H. (1955). Asiatic Magnolias in cultivation. London, The Royal Horticultural Society. Wikimedia Commons has media related to Magnolia. Wikisource has the text of the 1879 American Cyclopædia article Magnolia. "Magnolia" . Encyclopædia Britannica (11th ed.). 1911.